TAG Heuer is a Swiss manufacturing company that designs and manufactures watches and other fashion accessories like eyewear and mobile phones. With Big Apple Buddy’s personal shopping service, you can now buy direct from the USA TAG Heuer online store anytime, anywhere. 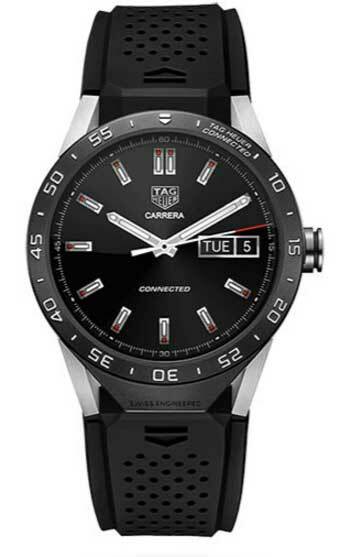 The TAG Heuer Connected Watch has both the classy and timeless elements of a TAG watch with the added benefits of computing intelligence. 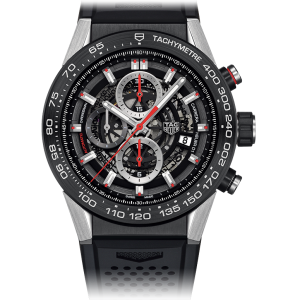 This watch combines the expertise of TAG Heuer’s Swiss watchmaking heritage with the connectivity and computing intelligence from companies such as Google and Intel. The watch has three different display zones, at 6, 9, and 12 o’clock which allows owners to display their favorite applications, activity information, and alerts. This watch will keep you connected at all times: whether it’s your average work day or you are travelling. The connectivity and convenience of this watch will help you keep track of time while also still maintaining the appearance of a classy fashion accessory. This watch comes in a variety of different color options, so choose whichever one best suits you! The TAG Heuer Carrera Watch is another great option for businessmen. The watch has a black skeleton dial and a black titanium case, which gives it a sleek and professional appearance. This watch is also water resistant up to 100 meters, so you don’t have to worry about getting it wet. The scratch-resistant curved sapphire crystal will further protect your watch from any damage, so you can be sure that this is an accessory that will last you. TAG Heuer also has a variety of women’s collection watches. 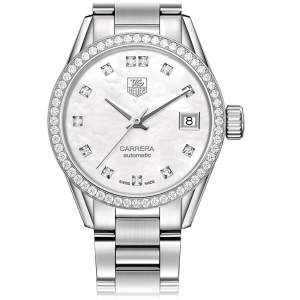 The TAG Heuer Carrera Women’s Watch comes with a diamond-encrusted and white mother-of-pearl dial. The polished and fine-brushed steel strap makes this watch an easy piece to wear with anything. Its sleek and professional design will go well with any formal outfit and add some extra flair to a casual one. This watch is also water resistant up to 100 meters, so you don’t have to worry about spilling a bit of water on it or getting caught in a rain storm. Add this classy and timeless accessory to your wardrobe as an easy piece to wear with anything! Unfortunately, the USA TAG Heuer online store does not currently offer international shipping. However, Big Apple Buddy, your personal shopper, can help you buy products direct from the official USA TAG Heuer online store and ship them to your doorstep, no matter where you are in the world. We offer international shipping to over 110 countries including Australia, Austria, Azerbaijan, Bahrain, Belgium, British Virgin Islands, Brunei, Bulgaria, Canada, Chile, Costa Rica, Croatia, Czech Republic, Denmark, Estonia, Fiji, Finland, France, French Polynesia, Germany, Gibraltar, Greece, Greenland, Hong Kong, Hungary, Iceland, Indonesia, Ireland, Israel, Italy, Japan, Jordan, Kuwait, Latvia, Liechtenstein, Lithuania, Luxembourg, Macau, Malaysia, Maldives, Malta, Marshall Islands, Mauritius, Monaco, the Netherlands, Netherland Antilles, New Zealand, Norway, Oman, Poland, Qatar, Romania, San Marino, Saudi Arabia, Serbia and Montenegro, Seychelles, Singapore, Slovak Republic, Slovenia, Spain, South Africa, St. Lucia, Sweden, Switzerland, Taiwan, Thailand, the UAE, the UK, Vatican City, and Vietnam. If you would like to buy from the USA TAG Heuer online store, simply let us know which items you would like to order (by filling out the form below) and we’ll get back to you with a free international shipping quote within 24 hours!